Alex G. Campbell's No Mo Dough was the impressive 2 3/4-length winner of Saturday's $100,000 LARC Sir Barton Stakes at Pimlico, kicking clear in a big way in the stretch under jockey Jose Ortiz. The sophomore son of Uncle Mo covered 1 1/16 miles over the “good” track in 1:44.13 for trainer Graham Motion in his first try against stakes company. True Timber broke on top of Time to Travel, leading by a half-length down the backstretch through fractions of :23.73 and :48.33. Hedge Fund was right behind those two at the rail, tracked by Greek Prince, Watch Me Whip and Honor the Fleet. No Mo Dough spotted the main body of the field at least five lengths in the early going, but ranged up into contention approaching the far turn. Time to Travel wrested the lead from True Timber at the head of the lane, but Ortiz had just angled No Mo Dough about eight paths off the rail to find clear running room as he straightened into the stretch. No Mo Dough never changed leads but took off like he was shot out of a cannon from the quarter pole, darting toward the rail but easily flying past Time to Travel for the 2 3/4-length win. Time To Travel held second in a photo over True Timber. Hedge Fund crossed the wire fourth, but was disqualified to sixth for interference with Society Beau near the eighth pole. For that reason Honor the Fleet was placed fourth, with Society Beau moved up to fifth and Hedge Fund sixth. No Mo Dough was bred by his owner in Kentucky and is out of a daughter of Deputy Minister. He won at first asking in March of his sophomore season, then bounced to a fourth-place finish in a fourth level allowance. He came back with an allowance win on the Kentucky Derby undercard, and the Sir Barton marks his first stakes victory. Overall, No Mo Dough has a record of three wins from four starts for earnings of over $120,000. 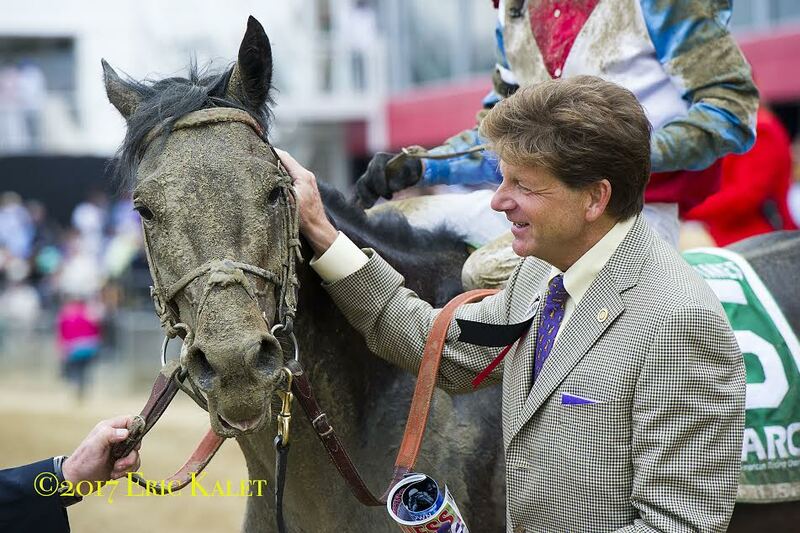 This entry was posted in Racing and tagged Deputy Minister, Graham Motion, jose ortiz, no mo dough, pimlico, Pimlico Race Course, sir barton, sir barton stakes, time to travel, True Timber, Uncle Mo by Paulick Report Staff. Bookmark the permalink.